We are always the number one company to call for any of your junk car removal needs here at St George Tow Truck Company. Our expert junk car removal team will always ensure that your junk car removal job goes a seemliness as possible when you call us to remove your junk car. No matter the situation you are in with your junk car we will always make sure we go above and beyond to be fast and efficient and get the junk car out of the way for you, and out of your sight so you no longer need to see it or think about it. We consider ourselves experts in the department of removing junk cars and we want to not only ensure you that we can get the job done but educate you in all of your options depending on the condition of the car and what you are wanting to do with your junk car. Your best choice for junk car removal in St George is always going to be St George Tow Truck Company. We know that we are able to bring you the best junk car removal service in all of southern Utah. When you are ready to remove the junk car from your home, yard or business property we are here and ready to help get the unwanted vehicle out of your way. Our Experienced team of tow truck drivers and junk car removal experts will respond to your request quickly and get the car or vehicle taken care of in no time at all. 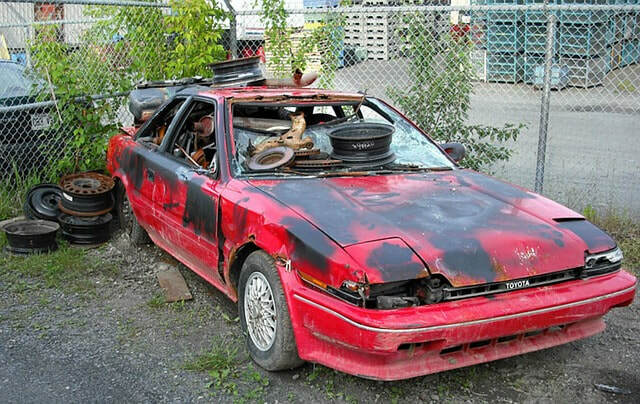 We are proud to offer only the best in quality and performance when dealing with any junk car removal job we take on. With every junk car removal job we take on we are sure to provide the best service and ensure that you are satisfied with the junk car removal job that we have provided. We know that word of mouth is a powerful thing, and we know that you will be satisfied with the services that we have provided you, and you will tell your friends if they ever ask how you got rid of your old car. So when your friends ask, How so i get rid of this old broken down car you can tell them about the great experience you had and how easy it was to just call St George Tow Truck Company. Even though you are just calling someone to get rid of an old car you no longer care about we feel it is important to show you how much we care about our customers no mater what the tow job is that you have hired us for. Handling each job in a professional manor and ensuring the satisfaction of our customers is always a top priority for us here at this local towing company in St George. Professional business practice insures that we are doing the best we can for our customers which in return is why we are still able to be in business serving the people of St George and removing those unwanted cars for you. We cant wait to serve you and show you our great working employees and help you remove your junk car or help you with any other towing need you may have. Not every Junk car removal job is the same and we take great pirde in being attentive and listening to the needs of our clients. It is important to us to provide the service that you are looking for even if we need to adapt to the needs of our clients to create the experience that they are looking for. We value our clients and will listen to what you need to have towed and find the best option for you and help you to be knowledgeable in different options that you have with getting rid of your old car. We can get it to a mechanic or even a scrap yard or just take it away and figure it our for you if all you want is to just have that old non running vehicle gone.